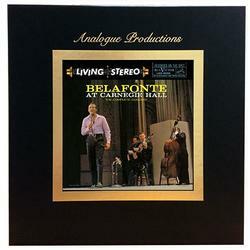 (5-LP set) Described by reviewers as "the quintessential Belafonte package," Belafonte at Carnegie Hall captures the excitement of a Harry Belafonte concert at the height of his popularity. What Analogue Productions has done with this 5LP 45 RPM box set release exceeds other vinyl versions. We've included the entire concert. The fifth disc in this premium set includes tracks heretofore missing from prior editions due to space limitations. They include Belafonte's spoken introduction before launching into the touching and tender "Scarlet Ribbons," followed by the orchestral overture.